Our culture loves to produce labels for everything. So it may not surprise you that there is a term for people who were born before the digital age but now live in the digital age. Rightly so, they are referred to as “digital immigrants”. We may know them more commonly as seniors, grandparents, senior management, seasoned teachers and anyone else of that generation. The label attached to those born during or after the digital age are the digital natives. They have always lived in a world of digital technologies. We think of them as the whiz kids with programming, the ones always attached to a cellphone or other device, and the ones who are younger by definition. By contrast, the digital immigrants are those who have slowly adapted to web surfing, emailing, texting and the instant world of social media and on demand entertainment. In the education world, you can have a mix of immigrants and natives and it may seem that a generation gap exists. But as more and more immigrants immerse themselves in the digital world, the gap is closing, and perhaps disappearing. Dealing with this difference may have less to do with technology and more with the two worldviews they represent. According to the U.S. writer who in 2001 coined the popular term “digital native”, Marc Prensky claims the digital native is becoming the dominant global demographic, and the digital immigrant is in decline. Author Jeff DeGraff analyzes how the worldviews of these two groups affects how they communicate and how others can relate to them in the workplace, the classroom and other areas of life. DeGraff summarizes that the digital immigrants divide the world into hierarchies, mostly across lines driven by values. These can include race, religion, marriage and even government. But people of different generations will always see things differently. In contrast, the digital natives view their world more equalitarian. In a horizontal way there are no hierarchies. The sharing of ideas, things and even work can cross these boundaries. So how can people of these two groups work together? 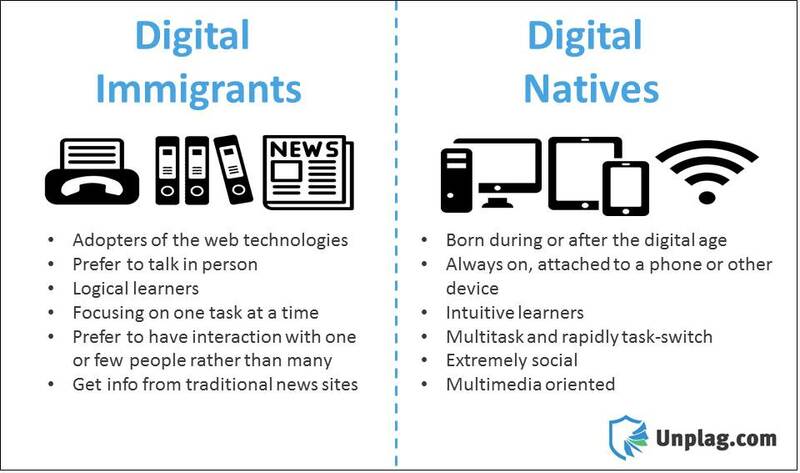 How can digital immigrant educators teach digital natives? It comes down to creating opportunities where they learn from each other. The generations, in some ways, feed off each other. Digital immigrants invented the microchip, the Internet, the cellphone, text messaging, all decades ago. But the greatest users are the natives. Collaboration is the key. Allowing for a variety of people with a variety of abilities and experiences must be paramount. For teachers, it means developing lessons based on building horizontal solutions. There are many ways to come to a conclusion, and with access to so many means, embracing all the technology available only leads to broader understanding of the problem. Including a place for values in lessons will also allow a deeper connection to the problem and the solution. 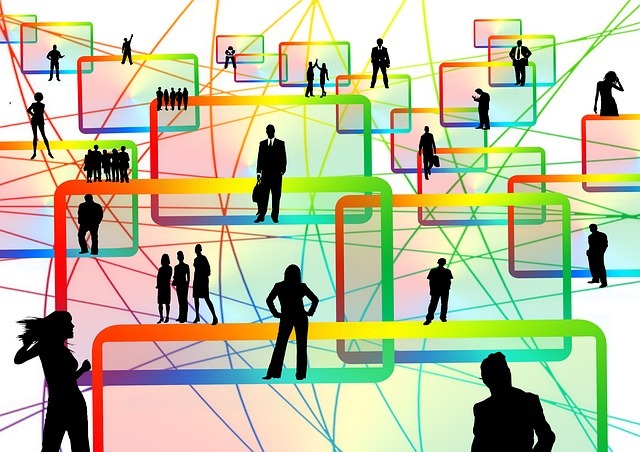 Digital natives are driven by productivity. Their goal-oriented working style may seem aggressive and competitive so incorporating more value in the process may be a good strategy. From the natives, the immigrants can learn to be more open and willing to engage with learners of differing backgrounds. There is less reliance on an institutional structure in the open meritocracy the native lives in. Immigrants can learn from the natives how to sift through and focus the resources, which are aplenty and be not as overwhelming for the native. They can learn to scale the learning and build what is possible. Digital immigrants can teach natives to achieve goals quickly. They can help the techno wizards scale the learning and build what is possible. They can look at the existing institutions and repurpose them or rethink their vitality. For example, in an adult course about scrapbooking, a native may be able to offer great ideas for layouts, image, design and labeling, while the immigrant would contribute their knowledge about storytelling and the value of including worthy artifacts. The real world value of personalizing the memoir emerges. How can teachers born before the digital revolution better prepare students for the future? The best approach for integrating technology into today’s classroom is through adopting a hybrid learning model. The blending of new ideas, with the student-teacher relationship still holding everything together, works well. Student’s interest will always lie with the teacher’s ability to create learning experiences that go beyond the traditional classroom, regardless of their own technological savvy. Teachers need to guide the student learning by providing questions and context, designing instruction, and ultimately assessing the quality. Technology is the student’s tool, but the teacher is the driver.